Forecast and technical analysis EURUSD on November 07, 2018. On Tuesday the 6th of November, trading on the euro closed higher. Market activity was low, pending the results of the US Congressional elections. Market participants tried to take into account the outcome of the elections, but to no avail. Trading closed at 1.1400. The dollar periodically came under pressure because investors were afraid of a victory by Democrats in the House. With the Democrats taking control of the House, it will be more difficult for the Trump administration to push forward legislation. Volatility increased during Asian trading when the votes began to come in. 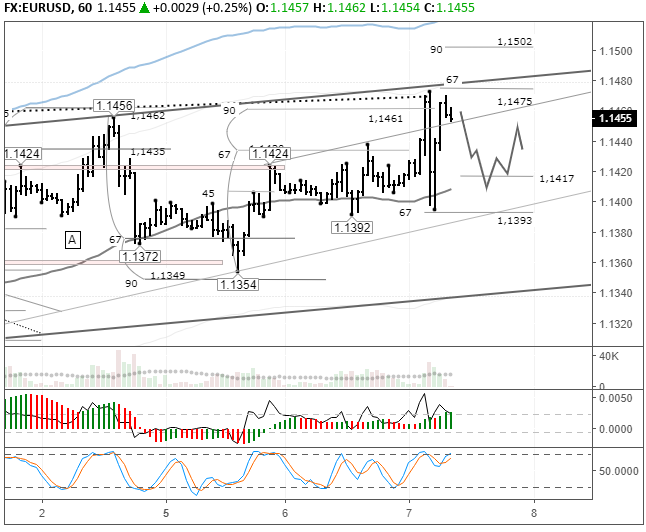 The euro rose 1.1473 and from there it dropped to 1.1395. It is currently at 1.1453. 10:00 Germany: industrial production (Sep). 11:00 Switzerland: foreign currency reserves (Sep). 11:30 UK: Halifax house prices (Oct). 13:00 Eurozone: retail sales (Sep). 18:00 Canada: Ivey PMI (Oct). 18:30 US: EIA crude oil stocks change. 23:00 US: consumer credit change (Sep). My expectations for yesterday were met. Today's forecast for the euro consists of a rollback to 1.1417, followed by a rebound to 1.1450. I would not count on strong growth on the euro/dollar pair because apart from Italy, the EU has yet another problem. Due to the conflict with Brussels, Poland may withdraw from the EU (Polexit), President of the European Council Donald Tusk stated. However, this issue will be put on the backburner until the last of the results of the US Congressional elections come in. The price is at the resistance (67 degrees and the upper line of the channel). If the day closes according to my forecast, then on Thursday I will consider a weakening of the euro. Let's not forget that the US Fed will announce its interest rate decision today. A rate hike is not expected, so the market should respond calmly to this event without a press conference by the Fed head.